Meet my pretty little princess Kamarri. 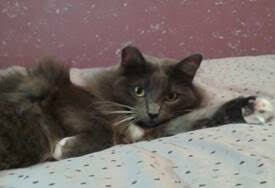 She has a silky smooth gray and white coat, also referred to as a ‘œblue’ coat, she is microchipped, and current on all her vaccines with the accompanying paperwork. She is litter box trained and will be two on June 26. She is unhappy in my home and wants to be an outdoor kitty, but I cannot offer her that option. Kamarri was born to a feral mother and was spayed while feral so her right ear has been clipped. She found a home at 4 months old and lived with three other cats for 4 months. She was given up as her owners had to move and could not take her, and that is how she came to be part of my family. Kamarri has lived with me and our 2 year old cat for 14 months and is clearly not happy. We adore her as she can be so very sweet, yet she has made it abundantly clear she does not want to be solely in the confines of a home. She wants to run and jump, chase, stock and prey, all of which she cannot do strictly as an indoor cat. I would love to see Kamarri rehomed to someone with land, and possibly a barn so she can run and be free, yet have the option to come inside for guaranteed meals and a soft place to lay her head if she so chooses. If this sounds like your perfect cat, please email me at darispeirs@aol.com.